What does it mean to be a rebel at work or a rebel within internal comms? That’s the question we set out to answer during our most recent live webinar with Communications expert, Advita Patel. Advita has over 14 years of experience in Internal Communications and Transformational Change and has worked in a variety of sectors including Education, Health and Transport. She’s completed a Masters in Strategic Marketing and recently a diploma in IC. She’s also the current Vice Chair for the Chartered Institute of Public Relations Inside group (CIPR Inside) the Internal Communications committee for CIPR UK. She knows that by doing the same things over and over, and following the status quo, you’ll never gain the influence and importance you deserve as an internal communicator. 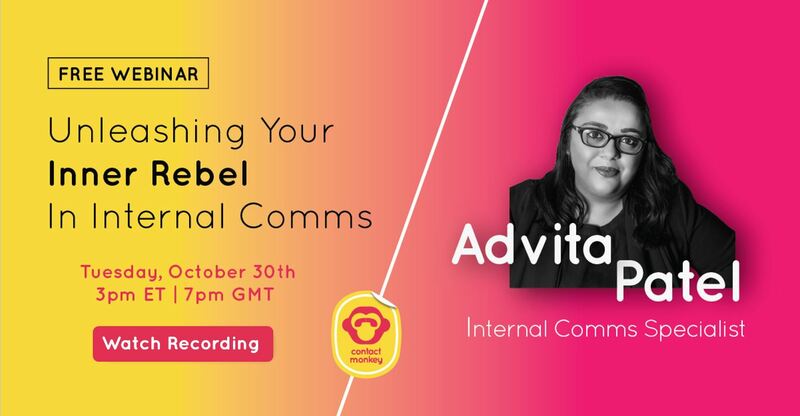 Which is why we decided to collaborate with her to put together a webinar teaching comms pros how to unleash their inner rebel within internal comms. So, here are my key takeaways from the webinar on what it means to be a rebel within internal comms. According to the illustration below by Tanmay Vora, a rebel should demonstrate certain attributes. These are the very attributes Advita believes internal comms rebels possess. Internal comms pros are often creative, care a lot and like to express their “quirky” personalities. This doesn’t mean that they’re troublemakers. In fact, it often means they care more than anyone else about the work that they do and need an environment where they feel safe to challenge leaders and ask questions. They love being coached and appreciate honesty from their leaders. They understand that rebelliousness often involves taking risks and aren’t afraid to be courageous to stand up for what they believe in! A rebel shouldn’t be afraid to ask the right questions. In fact, asking questions is essential for comms pros to evaluate and communicate changes effectively to employees. This means you sometimes need to ask yourself why certain information needs to go out? How does a certain project link to your organization’s overall business objectives? Once you start pushing back a little, and challenging things that are not adding anything to the business you’ll see a shift in attitude and better results for you and your team. Conflicts at work are inevitable. Advita emphasized the reason many comms pros often run into conflicts is because they care. She shared an example of how a senior leader she once worked with was hesitant to share their survey results as they weren’t very impressive. She stressed that in a situation such as the one she faced, it’s important to clearly communicate to the leader the reason why you think this information needs to be shared using facts, figures and data. She further urged our audience to read research papers, listen to podcasts and audio books and get support from their professional networks in order to resolve the issue in the most pragmatic way possible. Honest feedback and being able to stand up for what you believe is right is essential for a comms rebel, especially if they want to become trusted advisors to upper management. Becoming a trusted advisor in internal comms ain’t easy! Advita herself has had to work hard to gain that status during the course of her career. She recalled working within a role which involved looking after 3,000 staff members, most of whom were remote. Unfortunately, the leadership team she was working with did not have comms support before. Advita felt she really needed to make an impact and help them understand the value of internal comms. In situations such as these, Advita advised the audience to understand the company culture and the organizational lingo. “Get to know your leaders and try to understand who they admire and why,” she said. She recounted how she took courses such as “Finance for non-finance people” to understand how to speak to executive leadership in their language. A rebel should never be afraid of researching and investigating the needs of workers within their organization. Knowledge is power and it definitely helps to find advocates or internal influencers. “If you deal with remote workers, you really need to go out and talk to factory workers and get to know them,” Advita advised. This is a great way to uncover information these workers would normally feel hesitant revealing to executive leadership. The more information you have on what goes on internally within your organization, the better you’ll be at communicating to relevant stakeholders on how to solve specific problems. This is how you’ll bring real value and hone your status as a trusted advisor. 6) A Rebel Faces Challenges Head-on! As an internal comms rebel, you should thrive on finding a solution to all problems. This means you need to channel your inner creative so you can provide out-of-the-box solutions to certain organizational problems. While working for an airport, Advita once received the challenge of moving 11,500 employees to a new car park within a span of 3 months. All the employees worked across 200 different businesses so making them understand why this move was vital was a real challenge. Advita suggested the idea of introducing virtual reality to communicate to all the businesses what the future of the airport would look like. Introducing goggles and a storyboard, Advita and her colleagues were able to sell the idea effectively using virtual reality to all the stakeholders involved. Moral of the story: don’t be afraid to get super-creative in order to solve a problem that appears to be unsolvable. You just need to channel that inner rebel to come up with an out of the box solution. As a rebel, if you expect honesty and authenticity from your leaders, then you need to be upfront and honest yourself. Internal comms pros can often run into ethical and moral issues and it can sometimes be hard to recognize when to speak up and stand up for what you believe in. For Advita, the challenge presented itself in the form of an equality, diversity and inclusion issue. “A senior executive leader demanded I take down posters of a staff member wearing a religious symbol. This would’ve been contradictory to remove as we promoted Equality, Diversity and Inclusion at the organization,” she explained. She decided to speak up and use facts and figures as well as the organization’s policy document on diversity and inclusion to explain her reasoning to the leader on why she couldn’t remove the posters. “If it’s a moral dilemma or an ethical challenge, you need to stand up and push back,” Advita stressed. CIPR’s code of ethics is also an excellent resource you can check out when confronting ethical issues as an internal comms pro. Once you get executive leadership to sign off on your strategy, you’ll be able to push for certain changes by getting early executive-buy in. In order to ensure your strategy is engaging and effective, you should strive to connect it to your organization’s overall business objectives. Don’t be afraid to use a PEST analysis, evaluating certain political, economic, social and technological factors that may impact the business when outlining your comms strategy. It also helps to ensure that any objectives you’re putting down in your strategy are SMART: specific, measurable, achievable, relevant and time-bound. Measuring your internal comms may appear to be an anti-rebel quality, but it’s one you must have to ensure success. Advita advised the webinar attendees to examine other areas and departments of the organization and evaluate how they measure for success. The HR department has tons of data that internal comms pros could also utilize and benefit from. Before you decide to measure anything, always keep in mind what you’re trying to achieve. What’s your end-goal? It’s always great to measure the success of any campaign from the start, so for example if you’ve launched a health and safety campaign with the goal of lowering accidents reported in the office, be sure to evaluate how many incidents were reported before the launch of the campaign and how many after? Did the numbers go up or down? We, at ContactMonkey have also written on how to find the right metrics to prove the value of IC to the C-suite. Remember, as a rebel, you must always be investigating and finding solutions to every problem. Forget about the boardroom seat and work on building your “Trusted Advisor” status. Ready to unleash your inner rebel and measure for success? Want to learn how to track your internal comms using ContactMonkey? We can set up a personalized demo for you and your team. Just click on the button below to book your demo! Start Tracking Your Internal Employee Emails! to your Outlook Distribution Lists!